Were your ancestors apprentices at the Elswick Works? I’m pleased to report that work is progressing well on the ‘Workshop of the World’ project to catalogue our Vickers Armstrong archives collection. I’ve recently been working on the firm’s administrative records, which include a large quantity of agreements. Many of these relate to mergers, leases, patents, licensing and agency agreements. However, one does stand out from the rest – a letter dated 23 October 1931 from Sir W.G. 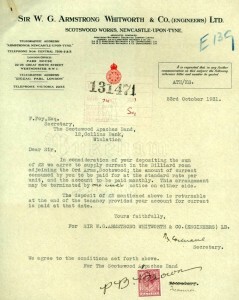 Armstrong Whitworth & Co (Engineers) Ltd to the Secretary of a local jazz band, the Scotswood Apaches agreeing to supply electricity to the Billiard Room of the Ord Arms, Scotwood (TWAM ref. DS.VA/2/22/4). This document gives a nice little insight into the local music scene. That’s one of the great things about being an archivist – you never know what you might unearth! Letter to the Secretary of the Scotswood Apaches, 23 October 1931 (TWAM ref. DS.VA/2/22/4). 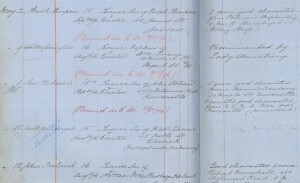 During the past couple of months I’ve also catalogued the personnel records we hold for the firm. Sadly, only a relatively small quantity of these survive. However, those that do include some very interesting apprenticeship records. 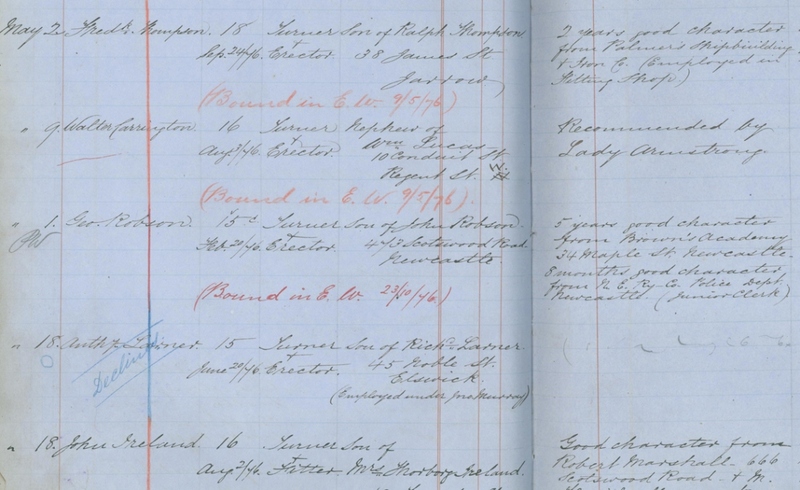 There’s a series of three apprenticeship registers covering the years 1896-1941, which appear to have been kept by the Elswick Works Ordnance Department. Information given in these registers includes name of apprentice, name and address of parent, trade, date of birth, date started, details of wages and remarks. The remarks column often gives a clue as to how each person got the apprenticeship, whether it was through previous employment as a post boy, a family link to the firm, recommendation by a member of staff or a personal application. It seems that your chances of getting an apprenticeship were much greater if you or your family were already known to the firm. Many of the apprentices are listed as fitters and turners, although other trades include smiths, pattern makers, joiners, electricians, moulders, wiremen, whitesmiths, boilermakers and coremakers. 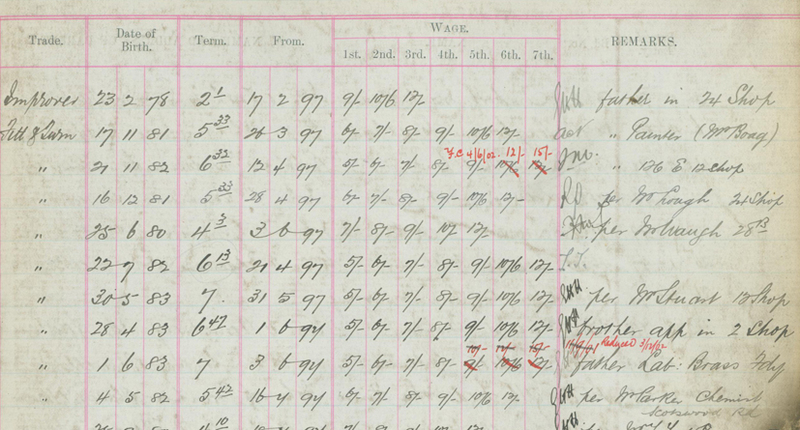 The personnel records also include a fascinating register of applications for apprenticeships covering the period 1856-1893 (TWAM ref. DS.VA/2/35). As well as including basic details of each applicant (such as name, age and trade) some of the entries include personal remarks about them. It’s clear that appearances really mattered. Many of the comments used are stock phrases such as ‘strong, good looking boy’ or ‘respectable and intelligent looking’. Entries also occasionally refer to the respectability of the applicant’s parents. Most of the comments are favourable but there are exceptions. One of the less flattering ones relates to Francis Wright, a brass moulder, who is described as ‘not very respectable or intelligent looking … Very indolent looking’ (TWAM ref. DS.VA/2/35 p128). Comments on the apprenticeship application of Francis Wright, 1871 (TWAM ref. DS.VA/2/35 p128). The entry below Wright’s relates to Edward Brice (an iron moulder, aged 14) and contains the fascinating remark “… Lady Armstrong said to take an interest in the family since the death of their parents”. 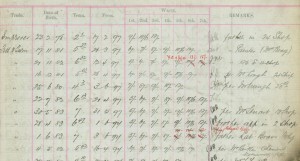 Edward Brice’s application was successful and he started his apprenticeship on 6 November 1871. Having an influential supporter could certainly get you a foot in the door but it could only carry you so far and I’m afraid that it didn’t prevent Edward Brice from later being discharged for misconduct. Note in the apprenticeship application register relating to Edward Brice’s dismissal, c1871 (TWAM ref. DS.VA/2/35 p127). The register of apprenticeship applications sometimes includes remarks about an applicant’s previous employment. The entry below for Frederick Thompson shows that he had “two years good character from Palmers Shipbuilding & Iron Co.”. 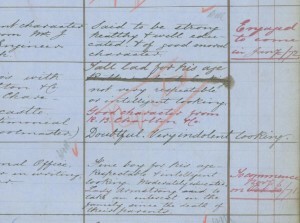 Examples of remarks entered in the apprenticeship applications register, 1876 (TWAM ref. DS.VA/2/35 p201-202). Interestingly the entry for Walter Carrington (directly below that for Thompson) documents another feature of the register – recommendations by a senior figure within the firm. In the case of Walter Carrington it simply states “Recommended by Lady Armstrong”. His entry doesn’t include any other details about character, appearance or intelligence. It’s safe to say that Lady Armstrong’s backing was all the recommendation he needed. The apprenticeship registers in the Vickers Armstrong collection should be of real interest to family historians. If you think your ancestors might be listed in there then why not visit the Archives to look through them. You can find details of our location and opening times on our website. 13 Responses to Were your ancestors apprentices at the Elswick Works? According to the 1891 Census, my grandfather, James (Maurice) Pearce was a ‘Brass Finishers [?] Apprentice’ at Armstrong Whitworth’s, living at Liddle Road. By 1901 he was an ‘Engine Fitter’ and in 1911 an ‘Insector of Work (Lathe) in the Ordnance Works. In 1916 he was described as a ‘Gunnery Inspector’ on my father’s application to go to Dame Allan’s School. I should be very interested to know if his name appears in any Personnel records from this time and also why he may have left left the firm. Perhaps he was laid off after the War? In any event he was apparently a well-known musician and singer and became a music teacher in Newcastle. He died of cancer in 1926. I hope to be able to visit the Museum & Archives durig this year and would like to know what papers I may be able to access. Many thanks for any help and advice you can give. Sadly, relatively few personnel records have survived in the Vickers Armstrong collection. The records relate much more to the firm’s products rather than the people who worked there. 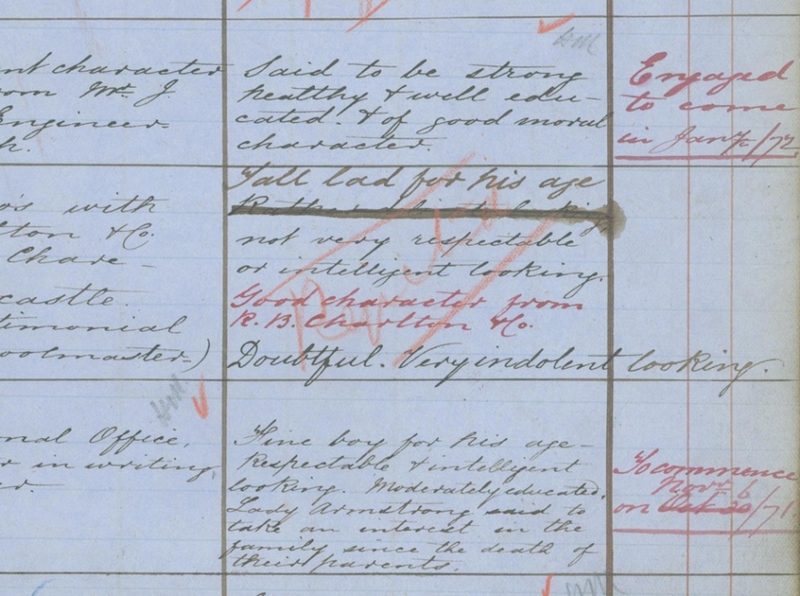 However, since your grandfather served his apprenticeship at Armstrong Whitworth it might be worth having a look at the register of applications for apprenticeships covering the years 1856-1893 (TWAM ref. DS.VA/2/35). That register is mention in my blog so you can get a flavour of it there. I hope you get the chance to visit the Archives later this year. You can find details of our location and opening times on our website http://www.twmuseums.org.uk/tyne-and-wear-archives/visiting-us.html. My grandfather was a marine engineer who was on board the Minas Geraes when delivered to the Brazilian navy in Rio De Janeiro in November 1910. He did speak about the mutiny but I do not have any other details. My grandfather was John James Anderson born in 1873 in Inverness. I would be very interested to find details of his employment at Armstrong Whitworth and information regarding delivery of the battleship. A colleague of mine, Ian Whitehead, produced an excellent blog about the revolt on Minas Geraes http://www.twmuseums.org.uk/engage/blog/a-revolta-da-chibata-%E2%80%93-%E2%80%98the-revolt-of-the-lash%E2%80%99-november-22nd-1910/. It’s worth a read if you haven’t seen it. Sadly we have very few personnel records for Vickers Armstrong. However, if you think that your grandfather might have served his apprenticeship at the Elswick Works then you’re very welcome to visit us to take a look through some of the documents highlighted in my blog. You can see details of our location and opening times on our website http://www.twmuseums.org.uk/tyne-and-wear-archives/visiting-us.html. This sounds a fascinating piece of archive material. My grandfather, William Gardner, worked at the Elswick Works as a foreman fitter. I have long sought details of his working life there and would love to know whether he was one of those men detailed in the apprentice records. Thanks for getting in touch. The apprenticeship registers we hold for the Elswick Works appear to relate to the Ordnance Department during the period 1896 – 1941. You’re very welcome to visit us to search these and you can find details of our location and opening times on our website https://twarchives.org.uk/visit-us. If you’re not able to visit us then you could use our paid research service and further information about that is available on our website https://twmuseums.org.uk/collections/research. Please do get in touch if you have any questions. I know you’ve said that there are very few personnel records. However, my 2nd great grandfather was recorded in 1911 as a Fitter in an Ordnance Works. He lived only 2 miles from the Elswick Works. I assume he worked there. He was 55 by then, and so not really apprentice material. Are there any other records that exist which might confirm he was there? Also, what would a Fitter at an Ordnance Works do? Is it just fitting engines to machines of war? Whilst researching a soldier from Felling, Gateshead, Pte. 9/1427 D.L.I. Edward Thompson 1895-1916 I have discovered that both he and his younger brother Thomas are listed in the census of 1911 as apprentices at Armstrong’s Ordinance Works as fitters, where their father Samuel Edward Thompson was employed in that capacity. Whilst researching my family tree, I found my great great Grandfather, William Hart Waddingham, received an MBE, in 1919, for his work as chief designer at Elswick Ordinance works. I recently purchased a brass plaque from an item made at the Elswick Works. I was told it was from a train but having looked on the internet, I am not sure. It has the ID EW5276. Do you have any means of finding out whether it was for a train or something else? Unfortunately, I will not be able to visit the archives, as I live in New Zealand. I have a number of ancestors who worked at the Elswick Factory. If you have any records of these fine men, I would love to add them to my research. My paternal grandfather, Robert Clark, worked at Elswick Works during the first half of 20th Century. He was probably born about 1870-75 and died in the 1960’s. He referred to his work as Brass Finisher. He was a leading and life long member of Prince Consort Road Methodist Chapel and lived his entire ,married life in Wordsworth Street Gateshead. He also belonged to the AEU Union. My grandfather Thomas Ford/e worked at Vickers Armstrongs from around 1924 to 1945. I think he was a fitter. He was born in 1875. He wouldn’t have done his apprenticeship there but any records about him would be appreciated. My uncle was also Thomas Forde and I’m hoping that his apprenticeship record exists somewhere. He worked there probably from around 1935 to 1980. His dob is 15/10/19. I think he was also a fitter/mechanical engineer/instrument mechanic. My grandfather and uncle lived in Elswick so I presume they would have worked at the Elswick works.